On January 10 and 11, United Neighborhood Centers of NEPA (UNC) hosted a training to educate Continuum of Care staff. 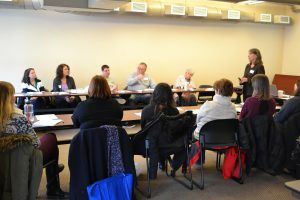 The Scranton/Lackawanna County Continuum of Care (CoC) is made up of representatives from local social service organizations that are committed to working together to improve services for the homeless in our region. CoC staff were educated about the principles of Housing First and how to use them effectively in the various types of housing interventions: Emergency Shelter, Transitional Housing, Rapid Re-Housing and Permanent Supportive Housing. UNC also extended the invitation to the neighboring – Eastern Balance of State CoC and Luzerne County CoC. The training was led by Suzanne Wagner, the founder of and a principal at Housing Innovations (HI). Ms. Wagner has provided training and consultation to hundreds of nonprofit and public agencies throughout the country to expand their capacity to provide effective services and improve coordination among homeless, housing and mainstream social service systems. She has also guided government and community groups through planning processes to strategically allocate resources and close gaps in services. She has worked with multiple communities on the development and implementation of strategic plans to improve housing options and design high quality services and systems to end homelessness. Staff attended from Wayne, Pike, Luzerne and Lehigh Counties, and 42 people took advantage of the training opportunity. We are very grateful to Ms. Wagner’s for her guidance and her work combating homelessness.